. . his “intensity and solemnity” (Arnold Whittall’s words) also pointing up their remarkable originality. John Eliot Gardiner is … one of the supreme choral conductors, and it’s been good to hear him in more recent masterworks of the choral repertoire. The balance of clarity and fervor he brings to Stravinsky’s Symphony of Psalms emphasizes its original blend of instrumental and choral color; this is its finest recording since Maazel’s, and one of the best ever. 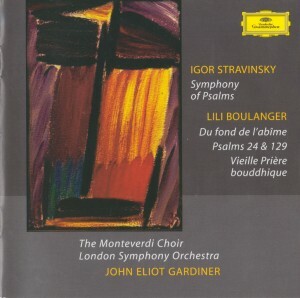 The music of Lili Boulanger is an apt complement on all levels, and Gardiner delivers full emotional impact with expansive readings demonstrating the quality and importance of these works. The three Latin psalms used in the symphony (Psalms 38, 49, and 150) are treated in a largely homophonic manner that both sharply contrasts with and, in an ineffable sense that lends a great deal to the sublime spiritual tone of the symphony, solemnly reinforces the more heavily contrapuntal texture of the instruments. On a technical level, Stravinsky sets that spiritual tone by omitting altogether some of the elements of the orchestra that we most closely associate with individual warmth and expression — the rich upper strings, the clarinets — and by recommending that the soprano and alto parts of the chorus be performed by a boys’ choir. The three movements are played without any pause. The first movement rides along on steady 16th note and eighth note figurations, on top of which the largely semitone-inflected voices offer their sober, slower-moving thoughts. The second movement is cast as a double fugue, the first for just the orchestra, the second joining all the forces together for Psalm 39. More kinetic in nature is the final movement, which contains the entirety of Psalm 150. Around the central, vibrantly energetic activity are two pillars — one introductory, one conclusive — of more serene, worshipful music. The second of these pillars is fashioned into an extensive coda that ends with an unusually spaced C major chord that, however difficult it might be to tune and balance (the first oboe, for instance, is given the E an octave plus a tenth above middle C), seems somehow to contain within it a reflection of the Symphony’s ideal of superhuman clarity. 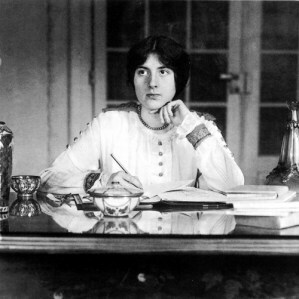 The real revelations on this release are the pieces by Lili Boulanger, younger sister of the more famous teacher and composer Nadia. Winner of the prestigious Prix de Rome when she was 16, she died in 1918 at the age of 24, leaving behind a small set of works that show an amazingly mature musical voice. Her music is dark and dramatic, and her unconventional harmonies and orchestral color reveal a debt to Debussy and Ravel. The four compositions of hers on this CD range from the simple, exuberant fanfares that open her setting of Psalm 24 to the spare contemplation of theOld Buddhist Prayer, whose text must have been a great comfort to her in her perpetual bouts with illness. Most astonishing of all is Out of the Depths, a gigantic setting of Psalm 130. Here one finds a totally original musical vocabulary and an expressive intensity on the order of Berg or Messiaen. The work’s final, unsettling collapse offers none of the peace the prayer wishes for so devoutly. And it whets one’s appetite for the works that never appeared. Gardiner is, it’s clear, an advocate of Boulanger’s works, and he and his British forces capture her originality. The singing of the Monteverdi Choir and the brass playing of the LSO are especially good. Also included is a impressive reading of Stravinsky’s Symphony of Psalms that nonetheless lacks the fire and intensity these forces bring to Boulanger. It’s for the latter that this CD really interests. 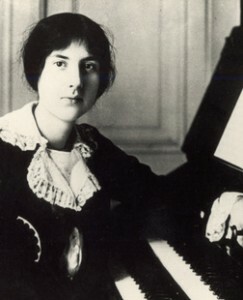 Lili Boulanger (Marie-Juliette Olga Lili Boulanger, 21 August 1893–15 March 1918) was a French composer, the younger sister of the noted composer and composition teacher Nadia Boulanger. A child prodigy, Boulanger’s talent was apparent even at the age of two, spotted by her parents, both of whom were musicians themselves and encouraged their daughter’s musical education. (Her mother, Raissa Myshetskaya (Mischetzky), was a Russian princess, who married her Paris Conservatoire teacher, Ernest Boulanger; grandfather Frédéric Boulanger had been a noted cellist, and grandmother Juliette a singer.) Boulanger accompanied the ten-year-old Nadia to classes at the Paris Conservatoire before she was five, shortly thereafter sitting in on classes on music theory and studying organ with Louis Vierne; she also sang and played piano, violin, cello, and harp. In 1913, at the age of 19, she won the Prix de Rome for her Faust et Hélène, becoming the first woman composer to win the prize; Nadia had given up entering after four unsuccessful attempts and had focused her efforts upon guiding her sister. Lili, first a student of Nadia and then of Paul Vidal, Georges Caussade, and Gabriel Fauré —the last of which who was greatly impressed by the young woman’s talents and frequently brought songs for her to read— was greatly affected by the 1899 death of her father; many of her works touch on themes of grief and loss.